In Hinduism, a mudra (Sanskrit, literally «seal») is a symbolic gesture made with the hand or fingers. Along with asanas (postures), they are employed in yoga meditation practice. Each mudra has a specific meaning, and they are a central part of Hindu iconography. With the onset of Buddhism, many mudra practices were absorbed into the culture. Common hand gestures are to be seen in both Hindu and Buddhist iconography. An example would be the outward-facing open palm known as Abhay (without fear) mudra, a gesture meant to dispel the fear of the devotee. 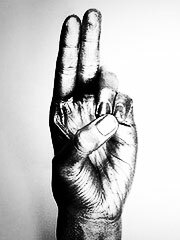 The Vajra Mudra is the gesture of knowledge. It is made making a fist with the right hand, index extending upward, and the left hand also making a fist and enclosing the index.